is a striking and spectacular palm that has become an absolute craze among landscapers in tropical and sub-tropical regions this last two decades. 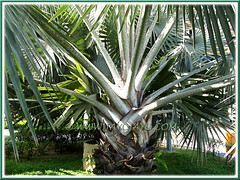 Majestic and domineering in appearance, the all-time favourite Bismarck Palm will brighten any landscape or scenery, be it day or night, with its brilliant silvery blue or gray to bluish green massive crown of beautiful fan-like fronds. If you have a large space in your garden to accommodate this huge and awesome-looking fan palm, go for it as the show-off Bismarckia nobilis will definitely not disappoint you! 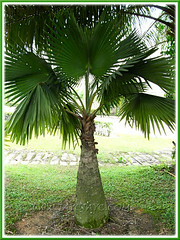 Features: Bismarckia nobilis, the only species of the monotypic genus, Bismarckia, is one of the world’s most spectacular palm. 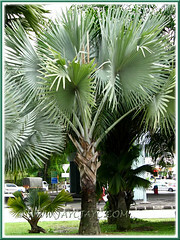 A solitary single-trunked fan palm of moderate growth in the hot and humid tropics, but slow-growing in cooler climate. 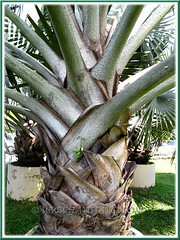 The Bismarck Palm is of gigantic size. It can reach up to 40-60 ft (12-18 m) tall in its natural habitat but generally seen about half that height in cultivation and has an enomous crown spread of about 20 ft (6 m) or more. A mature specimen will develop a stout and upright trunk, up to 12-18 in (30-45 cm) in diameter, somewhat broader and bulging at the base, brown or tan-coloured with traces of old leaf scars. 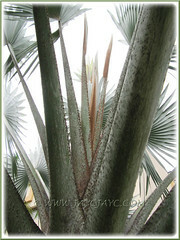 A juvenile specimen, on the other hand, will initially sport old leaf bases before maturing with a trunk that has no crown shaft. Its crowning beauty is the massive spread of huge and attractive fanlike leaves, numbering between 15-30 and typically silvery blue or glaucous gray in colour. 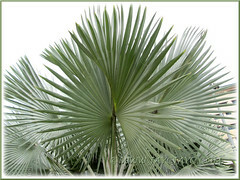 Between the two different coloured forms of the evergreen Bismark Palm, that is, silver/blue and green, the former is much more popular, strikingly impressive and robust while the green-leaved form is less attractive and hardy and more frost tender in colder regions. The eye-catching waxy and glaucous leaves, induplicate and costapalmate (has a short midrib or center spine), are stiff and huge, up to 10 ft (3 m) across, almost roundish and are divided into numerous single-fold segments with pointed tips, about one-third the length of the leaf blade. They’re held on 6-8 ft (1.8-2.4 m) long petioles that spirally emerge from the central growing tip. The leaf stems can be 10 in (25 cm) in diameter, slightly recurved, may be smooth and polished or covered with coarse hairs. 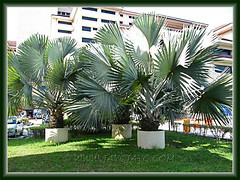 Bismarckia nobilis is a dioecious palm that have separate male and female plants. It produces inflorescences, about 1 m long, with thick, catkin-like branches and covered with inconspicuous flowers. Staminate and pistillate flowers grow on separate plants. Female flowers, if fertilized by pollen from a male plant, will eventually mature into roundish, chocolate-brown fruits, 1.5 in (3.8 cm) long, containing viable seeds for propagation. 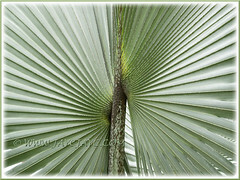 Culture (Care): Bismarckia nobilis is an easy-to-grow palm that’s fuss-free, hardy and robust. Light: Grows best in full sun but is tolerant of light shade. It loves hot and humid weather. Moisture: Moderate water requirement though can be faily drought tolerant when established. Soil: Prefers moist, fertile and well-drained soils, though adaptable to a wide variety of soil types. Others: It requires lots of space to spread out its massive crown and look its best. Bismarck Palm dislike being relocated or transplanted. Be careful not to injure its sensitive roots when repotting, otherwise may result in severe leaf dieback or eventual demise. Rarely needs grooming as old leaves fall easily. 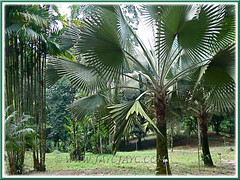 It’s free of serious pests and diseases, as well as not as susceptible to nutritional deficiencies as other palms. For subtropical and temperate regions: Hardiness: USDA Zone 9-11. In the warmer parts of Zone 9 it can be damaged by freezing temperatures but able to recover since it’s somewhat frost-tolerant. Propagation: By seeds that will germinate easily between 2-3 months. 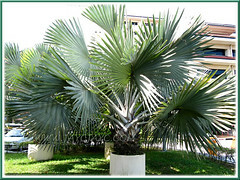 Usage: Bismarckia nobilis is excellent as a single specimen or planted in a group. Its stately and stunning appearance will present a captivating focal point in the landscape or home garden with a vast expanse. 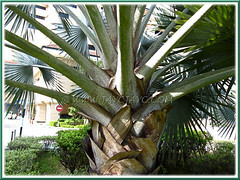 Ideal too with a large grouping of other palms, especially in Botanical Gardens, parks, or simply to beautify the compound of shopping malls, hotels and other commercial or residential settings. 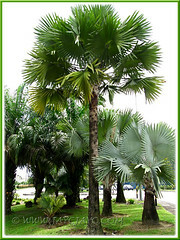 Great dramatic palm for landscaping roundabouts, along road shoulders and highways. This is the best, most informative article I have found about my beautiful pair of mature (~20′ tall) Bismarckias. I have a question perhaps you can help with; mine are in a raised planter that runs the length of my pool. The tiled pool wall rises about 3′ from the water level and forms the front of the planter, and the back of the planter is formed by a concrete cinderblock wall at our property line, which rises about 5′ above the level of the palms on our side (but the properties behind us are lower, so their side is about 10′ high). My question: Do my Bismarckia root balls threaten either my own tiled pool wall (above the water level) or the concrete cinderblock wall behind? Thank you for your consideration! Thank you very much for your kind compliment. So sorry :( that I’m unable to advise you… better to be ignorant than to provide you with the wrong advice.